Prague has many attractions to offer children on holiday with their families. Essentially, the city feels like a medieval fantasy, with its fortresses, cathedrals and castles sparking children's fantasies about princesses and knights. For starters, there is an entire castle district to explore. Next, Petrin Hill is home to a fantastic mirror maze and pony-riding area for kids to enjoy. The park areas for outdoor activities are a delight for kids and parents alike, while the local Toy Museum, the second largest collection of its kind in the world, will keep children entertained for hours. The Czech Republic also has a rich puppet tradition, with shows at the Black Light Theatre and the National Marionette Theatre usually charming the little ones. For young animal lovers, Prague has a Sea World and a zoo for kids to explore. 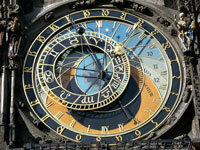 A visit to see the chiming of Prague's medieval Astronomical Clock is also a must. Taking a cruise to see the attractions along the banks of the river is a popular activity for the whole family. Children seem to love this mode of sightseeing, and the atmosphere on the spacious ferry boats is relaxed and informal. All in all, Prague is a great destination if you're travelling with kids.